The Regal Splendor hosta brings a beautiful variety of colors to your yard—all in one plant! It starts with leaves that combine blue-green centers with gold edges. Throughout the summer, expect tall lavender blooms to add to the display. 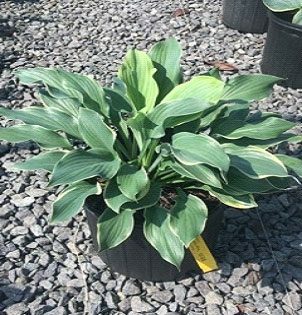 This hosta performs better in full to partial shade, making it a perfect choice for containers and flower beds that border wooded areas. Regal Splendor needs regular watering to look its best. Expect to water it weekly, or more frequently during periods of high heat or drought. It’s a fast grower, measuring up to approximately three feet wide and tall. Consider this hosta if you need to fill in a space quickly or if you have a new flower bed that you want to look established.